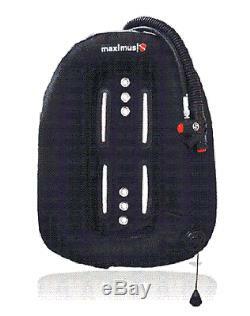 Red Hat Diving, Maximus Premium Tech 60lb wing package. Premium harness, stainless steel backplate and 60lb wing. Maximus the new breed of system BCD, designed to meet today's style of diving, and for the new trend of extended range diving. The stainless back plate combines with Premium or Sport harness and innovative horseshoe bladder (wing) to create a fully-functional BCD with excellent and flexible buoyancy, proper trim, suitable weight, efficient propulsion and integrated life support. Pockets to tailor it to your exact requirements. All system parts compatible with most other system wings. OMS, Halcyon, Dive Rite etc. 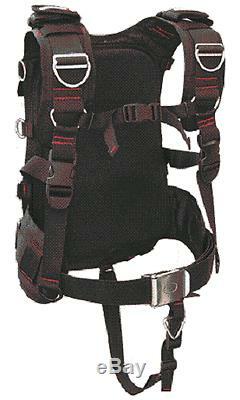 The full system comprises:- wing, (four choices) backplate and harness plus a choice of seven pockets. This listing is for the Premium Tech 30 package. Also available with the Sport harness. Check out my other items. 60lb wing(3rd picture shows the 30lb wing). Maximus outer shell uses 1680 denier NYLON with PVC backing to prevent abrasion and punctures on all BCs. We then add an inner bladder constructed from the same puncture-resistant 210-denier Nylon TPU inner. Maximus wing has 2 dump valves plus the pull dump. A semi-circular zipper around the inside of the wing allows for easy inspection and replacement of the interior bladder. "Trap-door" drainage system allows water to drain rapidly from the outer cover to minimize excess weight and diver effort reboarding the dive boat. The double bladder wing has an extra bladder with inflator and two dump valve. The latest batch have a revised inflator valve shown pictured. The S stands for Seapro not Scubapro. 3mm 316 marine grade stainless steel backplate, made in Yorkshire, laser cut and rumbled. For the 30lb 50lb 90lb and 90 double bladder wing and the harnesses have a look at my other items. Read to the bottom for a 3rd party report from a well known diving journalist as published in Scottish Diver. Description of full system and all components available. Padded back plate, double mounting slot, 1 inch or 2 inch crotch strap, perimeter mounting holes, polished finish on the stainless back plate and a choice of anodised colours on the aluminium one. The stainless plate provides around 6 lbs of non-detachable weight evenly distributed across the divers back. Heavy-duty shoulder straps in combination with optional chest strap allow massive adjustability. Two dump valves located at the bottom, rear of the bladder. Adjustable waist band with a quick release, stainless buckle provides. Lift Capacity: 50lb, 90 lb or 90lb double. 1680 Denier Nylon backed to prevent abrasion and punctures. You choose, type of harness, type of back plate, size of wing. Available as extra, Cargo and weight pockets. The unique elastomeric bands (use is optional) assist in deflation, but still allow the diver to orally inflate the BC. Elastomeric bands evenly compress the BC, eliminating the massive airshift associated with non-banded BCs that typically occurs when changing body plane. Typically retract the BC to a width less than the divers shoulders, greatly reducing Drag and Snag potential. By adding or eliminating bands in different parts of the BC, the diver can adjust. Lateral trim to compensate for stage bottles, cameras, etc. Head up, down or level. There must be dozens of wings out there for use when technical diving. On Dive boats ive noted the usual brands and a few lesser known setups, which for me are always interesting to have a look at. Over the years I have used a few types and brands such as the original Northern Diver Sea Eagle with a Stainless Steel (SS) Back Plate, now I use a mares bc for shallow stuff and the new Buddy Tek Light wing for my independent twins. For my technical diving I was going to use manifolded twin 12l cylinders and needed a SS or Aluminium (ALI) back plate to bolt them onto with ss bands. (Buddy dont recommend using manifolded twins with the buddy band system). I was trawling web sites looking for a wing when I came across Red Hat Diving, I liked the look of their wings, so I contacted John Hewitt, the. Proprietor and he kindly sent me up a 90LB Maximus dive wing with ss back plate and a premium harness to review along with other optional pockets, harnesses, and a couple of weight harnesses. Over the course of the last 4 or 5 months I have been trying out this kit on my deeper technical dives. The first thing that strikes you with this wing is that it is almost identical to the OMS wing. I had ample chance to compare the Red Hat Maximus with the OMS wing as my buddy Gordon Mackie of GM Diving uses one. There are two important differences between the wings though, firstly, the cost of the Maximus which is a fraction of the OMS set up. Secondly the materials used are lighter than the OMS. So where in these tight economic times I liked the price very much I wanted to ensure that the wing was up to the rigors of deep multi tank technical diving, here is how I got on. The Maximus wing is a truly modular system and you can customise it for your needs. The bladder of the wing can be supplied in 3 sizes- 90lb, 50lb and 30 lb. The outer of which comprises 1680 denier nylon with a PVC backing. Inside of this is a 210 denier. This makes a sturdy puncture and abrasion resistant package. I had initial fears re the inner bag as it felt so light and flexible compared to the old style clear plastic inner bags found on some bcs. I found out that it may be light but its very strong and the new TPU inner lining performed very well with no leaks or tears. On further investigation I found out that the TPU inner is first choice for many technical divers. A semi-circular zipper around the inside of the wing allows for easy inspection of the interior bladder. The wing also comprises a trap door drainage system which allows water to drain rapidly from the outer cover to minimize excess weight and improve diver comfort. It must work as I found no problems with trapped pockets of water. The bladder also contains 2 dump valves, one controlled by a pull toggle at the top of the bag and another to the rear of the wing. There is a corrugated inflation hose with a stainless steel inflation button. I really liked this as it added a wee bit of weight and kept the hose from moving around. One thing I did change on the wing was initially the corrugated hose came over the shoulder of the wing. I swapped this with the location of the pull dump so that the corrugated hose hung straight down the front of the wing as with the OMS wing. All these valves have the same fitting so you can set the wing up exactly how you like it. The inflation unit supplied does not have a steel cable running through it allowing it to be used as a pull dump as in most sport Bcs. This I expected from a technical wing where I like to see the gas being vented from my wing. The new version does, John. Lastly the wing is surrounded by elastomeric bands (use is optional) these assist in deflation, but still allow the diver to orally inflate the BC. I liked the bands and found they did not hinder inflation. If anything I would have liked slightly thicker bands adding a little bit more tension, or I could just slightly tighten the existing bands. With this set up the choice is completely yours. There is a choice of 2 back plates Aluminium that can be supplied in a range of colours for the fashion conscious and Stainless Steel. The first one is an Economy back plate from Taiwan, I decided to go for the 316 marine grade SS back plate made in the UK. All come with mounting holes allowing for height adjustment. There are also mounting holes around the periphery of the back plate. There is therefore no lack of mounting options. This gave me the advantage of having 6lb of non removable weight comfortably spread across my back. After my 5 months of use there was no sign of corrosion and the backpack looked like new. This is probably the most important part of any wing system. 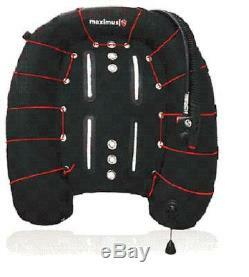 The Maximus offers 2 choices of harness. The Sports Harness is the more basic of the two harnesses on offer but I would say its very high spec. Two adjustable shoulder clips, 4 D rings, Padded Shoulder pads, crotch strap, Chest strap, back plate pad and a stainless steel buckle. I found the large utility/ mask pouch which is mounted on the waist band at the stomach very useful for popping all my tables, mask, and line cutters in. The only thing I would have liked to see in it was a little D ring to secure these items too. Weight pouches are also available to fit directly to the harness but I found these to be of limited use, especially with side mounts. Trim weight pouches are useful and there are pockets for sheers, a no sag pocket which looks good. There is also a vertical mounted weight pocket and a thigh pocket. There is plenty of variety, so you will be able to customise your kit exactly the way you want it. Its not as tough as the OMS but then very few things on earth are as the OMS is bombproof. The Maximus is certainly no cheep copy. I found it an extremely comfortable and easy to use wing. If you are into designer labels you will prefer to look at the fashionable brands. But if you dont mind not having a certain logo on your kit I would strongly recommend the Maximus wing system by Red Hat Diving. If a seasoned journalist and tester bought one what are you waiting for. For Highlands and Islands and Ireland please ask for quote giving your postcode. All goods have proof of posting so if they have not arrived when you think they should have please contact me before you leave negative f eedback. I always respond to feedback in kind. If you not completely happy with any Red Hat Diving product you may return it within 7 days of receipt. The item "Red Hat Diving Maximus Premium Tech 60lb wing package wing backplate and harness" is in sale since Friday, October 6, 2017. This item is in the category "Sporting Goods\SCUBA & Snorkelling\Buoyancy Compensators". The seller is "beechcroftdiving" and is located in Selby, North Yorkshire.